Bike Magazine recently touted the Key Grip in their “Fresh Produce” section on their website saying, “The new Key Grips come in a myriad of colors to match your bike… and the rubber compound is slightly tacky, but not uncomfortably reminiscent of a dive-bar floor.” We think that’s a pretty good mix of grip and hygiene, and are really happy with the compound. Check out the complete blurb here, and be sure to pick up your favorite set of Key Grips from our webstore! You can check out the review on Bikemag.com here. For 2018 the Operator’s have switched to a trunion mounted shock out back, you can check out the newly updated bikes here. Bike Magazine has just posted up their editors picks that form The Best of the 2017 Bike Magazine Bible story and our newest full carbon 140mm trail bike, the Hei Hei Trail made the cut. Picked by legendary MTB journalist and longtime Bike magazine contributor Mike Ferrentino, the Hei Hei Trail surprised Mike in a very good way. In fact he loved it so much he absconded from the Bike Magazine Bible Test Sessions with the bike, we haven’t heard from him since and he’s not answering his emails! You can check out the full story here and Mike’s original review from the Bible here. Below you’ll find a few photos of Mike at our launch last year on his very first ride on the Hei Hei Trail in Squamish, BC. Coming out of our 27.5 Operator test sessions at Retallack Lodge, Blake Jorgensen‘s photo of Kona Gravity rider Connor Fearon has been selected as the cover shot for the December 2016 issue of Bike Magazine. Head to the Cog post to check out the whole photo set and watch the video from Retallack again, and head to Bike Mag to for a preview and to buy your copy of the December 2016 issue. Another review of the Hei Hei DL and yet another affirmation that its progressive geometry and balanced pedaling platform is exceeding riders’ expectations. Bike Mag‘s Ryan Palmer tends to favor a 29er that shreds over one more focused on going uphill, but the Hei Hei DL solidly ticked both of those boxes for him. 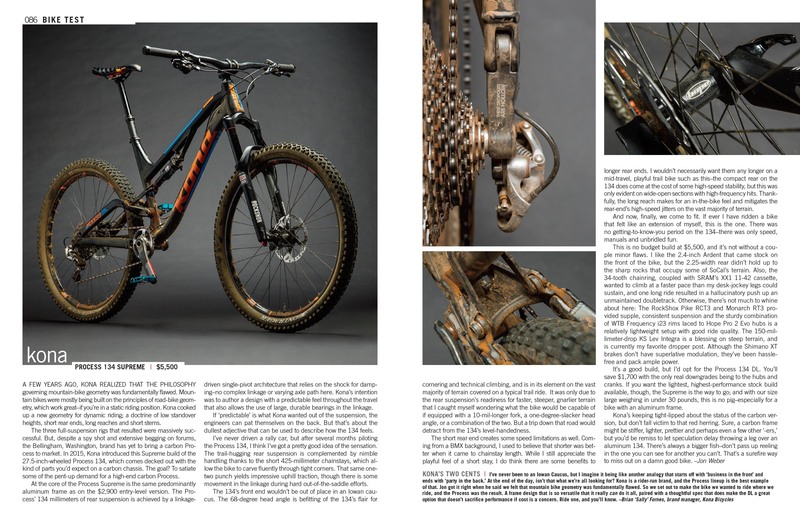 Read the full review online or in high res PDF and head to Bike Mag to see their subscription options. Bike Magazine’s Anthony Smith joined us for our Operator and Hei Hei Trail launch at Retallack Lodge last month. While he was at first curious about our choice to launch a bike with the Hei Hei name at a place known for its technical terrain, his tune changed quickly once he got on the bike. Head over to Bike Mag to read Anthony’s thoughts on the new bikes. We love Bike Mag. And this month we love them more than usual as they have posted up this comprehensive 2016 Process 134 Supreme review. You can check out the review here (or by clicking on the image below). You can also pick up a digital copy of Bike right here and head to the work … boardroom (we know you read magazines on the throne).